If your organization is using the free version of Microsoft Teams, you can easily upgrade to the full version by purchasing an Office 365 subscription plan for your users. The full version provides additional Teams features — like scheduling, audio conferencing, enhanced administration, and security capabilities — that the free version doesn’t provide. Office 365 combines the familiar Microsoft Office desktop suite with cloud-based versions of Microsoft's next-generation communications and collaboration services — including Exchange Online, SharePoint Online, and Office Online — to help users be productive from virtually anywhere through the internet. When you upgrade Teams, your existing Teams data will not be lost; all your teams, channels, chats, files, and permissions come with you. If you already have an Office 365 subscription, you’re eligible for the trial version of Teams (with your corporate identity), not the free version. The Teams trial provides the full version of Teams for a limited time. For more information, see Manage the Microsoft Teams Commercial Cloud Trial offer. How does Teams free compare to the full version of Teams? For a detailed comparison of Teams free and Teams features, see Compare Teams plans. You are the person who signed up for the existing Teams free subscription. If you are bringing your own domain, it isn’t already associated with Azure Active Directory (via trial or purchased O365 subscription). To upgrade and transfer your data, you have to buy your subscription through the upgrade process in the Teams application. If you purchased Office 365 with Teams without going through the upgrade process, you can’t transfer your data because you will already have a separate tenant. You can’t switch back to Teams free after you upgrade. You can’t merge multiple Teams free tenants into a single paid tenant. All users must be upgraded: a mix of Teams free and paid subscription users in the same tenant is not supported. How do I upgrade my organization? To upgrade to the full version of Teams, select Upgrade in Teams. Enter the email address that you use to sign in to Teams, and then purchase an Office 365 Business Premium plan. If you would like to purchase Office 365 Business Essentials or an Enterprise edition of Office 365, contact support. After your upgrade is complete, see Get started with Microsoft Teams for first steps and Adopt Microsoft Teams for a phased approach to Teams adoption across your organization. To find out more about Teams versions and their capabilities, see Compare Teams plans. For more information about upgrading to the full version of Teams, see Upgrade from Teams free to Teams. For additional admin tasks associated with upgrading users, including adding user licenses, changing user names, and assigning temporary passwords, see For admins upgrading from Teams free to a paid subscription. 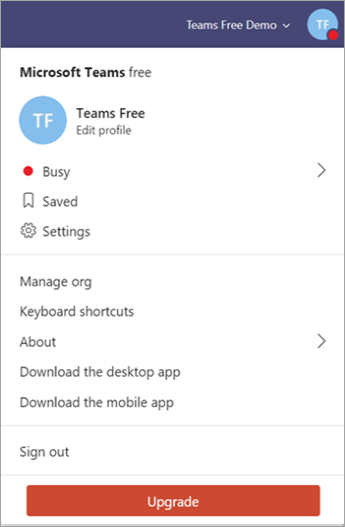 For information about managing Teams free in your organization, see Manage the free version of Microsoft Teams.